one of those moments | escaped. It's almost midnight and we just got back from grocery shopping, and Rayyan who usually would sleep through outings this time seemed restless and didn't want to sleep. We bottle fed him, burped him, held him in our arms but still he was awake. He refused to sleep; even though he was yawning like mad. He was tired, I think. Then I told the husband I'd breastfeed him, because that's the only way I know he would fall asleep instantly. Less than 10 minutes went by..and he's already snoring. That feeling. That your son would only need you to hold him (and breastfeed T.T) in your arms, and fall asleep instantly.. that feeling, I will never take for granted. As if all he needs in the world is you, no one else. And it kills you to think one day if you were taken away from your child, or vice versa. That feeling, I will never take for granted. awwww. now mesti zatil boleh relate dgn ibu zatil kan. boleh relate better. sbb dah phm perasaan seorang ibu tu. haish. anon pon nak anak jugak tp anon belum kahwin. kalau nak kahwin pon most probably sbb nak anak. 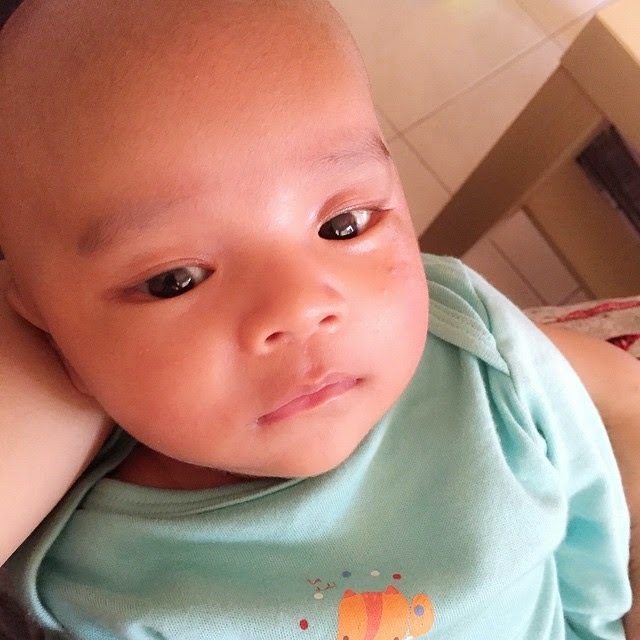 oh btw, muka rayyan, tang mata tu mcm zatil sikit. Yayyy hahah everyone (almost..) tells me he gets his daddy's features most sobs.